SAN FRANCISCO — Zola, maker of top-selling Coconut Waters and Açaí Juices in the United States, today announced the appointment of Robin Ynes, Chief Financial Officer, to its executive team. Ynes will lead finance and accounting from the company’s corporate headquarters in San Francisco. Ynes’ hire comes as Zola continues to enjoy rapid growth of more than 30 percent year-over-year. In keeping with that growth, the company has cemented its national footprint with significant distribution gains in grocery and natural food stores. Simultaneously, the Zola Coconut Water portfolio has also been one of the fastest-selling in the category since March 2012. Zola has expanded its executive team in response to this momentum, most recently hiring Marketing VP Rosa Compean to lead marketing and product strategy. And with Ynes now on board as the latest addition to the leadership team, Zola is well positioned to continue along its current growth trajectory. Ynes most recently served as Vice President and Corporate Controller at Odwalla, an American food product company that sells fruit juice, smoothies and food bars. In that role, he led a staff of 45 professionals, encompassing all accounting operations. Prior to that, Ynes was Corporate Controller at Core-Mark International, one of the largest marketers of fresh and broad-line supply solutions to the convenience retail industry in North America. He has also held senior-level finance and accounting operations positions at Genomic Instrumentation, BACC/Hope Technology Group, Wells Fargo Bank and Carson Pirie Scott Stores. At Zola, we are fanatical about traveling the globe in search of the best ingredients. Our philosophy is to go directly to the source, and our promise is to produce only the best-tasting, most nutritious and authentic functional beverages. 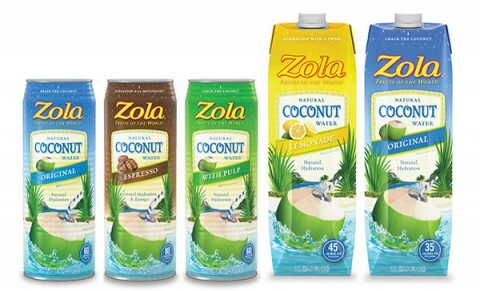 Zola is the maker of top-selling Coconut Waters and Açaí Juices in the United States. Zola’s products are now available at grocery and natural food stores across the U.S. and Canada. For a complete store listing, please visit: http://zolaacai.com/store-locator. For more information about Zola, please visit http://www.drinkzola.com.